Two Big New Additions in Stock Rover V4.0 - And Then Some! It’s time for Stock Rover Version 4.0, which our Stock Rover team is pretty excited about, as we think you are going to like it. As usual, there is an array of upgrades, including two signature additions to the Stock Rover architecture: the Investors’ Library and Portfolio Reporting. Before we get into those bigger items, though, let’s talk about some of the other new things you can do in this version. You can now search the Stock Rover website straight from the Stock Rover app. Using the new search box in the toolbar, just type in your query, and the results from the Stock Rover website will open in a new tab in your browser. It’s the same as using the search box on our website, except that you can access it right from the Stock Rover app screen. You’ll find the search box next to the ‘Help’ button in the toolbar at the top. Go ahead, search for something! You can now tag any ticker in Stock Rover with your own keywords for easy reference and organization. Just right-click the ticker, mouseover ‘Tag’ in the drop-down menu, type in your keyword, and hit enter. Note that tickers can only be tagged with one keyword. There is also a Tag column you can add to the Table through the ‘Add Column’ button so you can see and easily edit tags for all the displayed tickers. Click on a row in the Tag column to create or edit a tag. 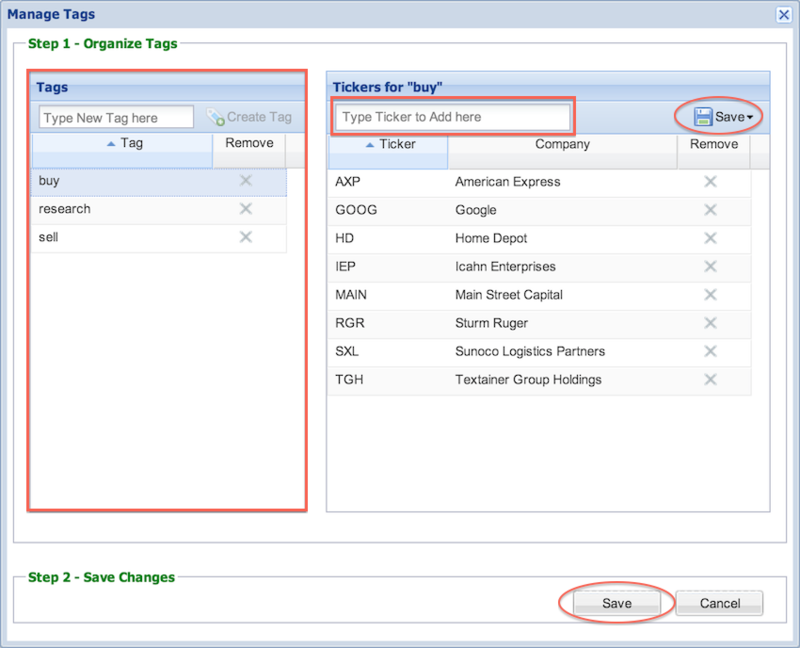 If you want to delete, edit, or otherwise manage your tags, click the ‘Manage Tags’ option from a ticker’s right-click menu. 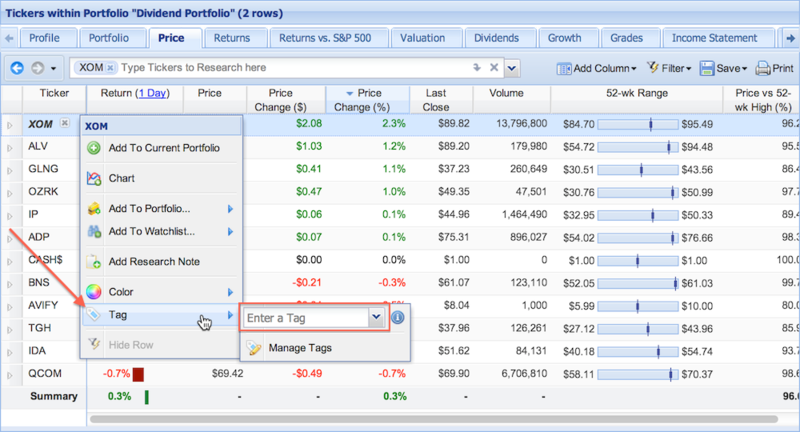 This will bring up a window where you can manage your list of tags and tagged tickers. 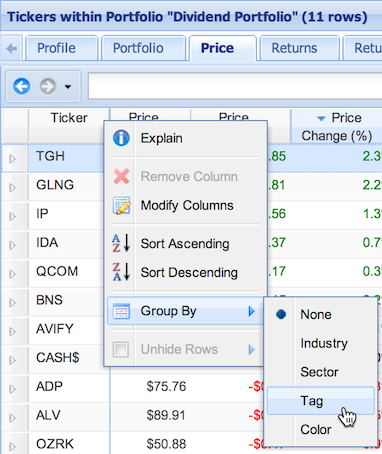 You can also save tagged tickers as a watchlist or a portfolio by clicking the ‘Save’ button in the top right. These management features are pointed out in the screenshot below. 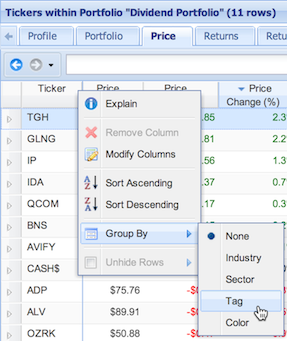 Like with screener tooltips, you can now see a snapshot of your portfolios and watchlists by mousing over them in the Navigation panel. To enable all Navigation panel tooltips, go to ‘Tooltips’ in the ‘Options’ menu in the top toolbar, and check the box for Navigation panel tooltips. 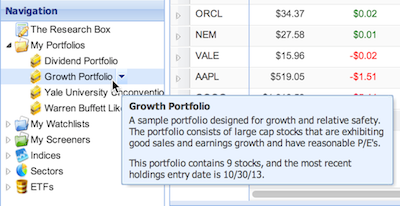 These tooltips (shown below) show a description of the portfolio or watchlist’s contents, the number of stocks, and, for portfolios, the latest holdings entry date. What’s that you say? Stock Rover can now keep track of my holdings history? It’s true! When you go to modify your portfolio, you can (and should) now enter the date on which the holdings listed are created or updated in the ‘As Of’ box. 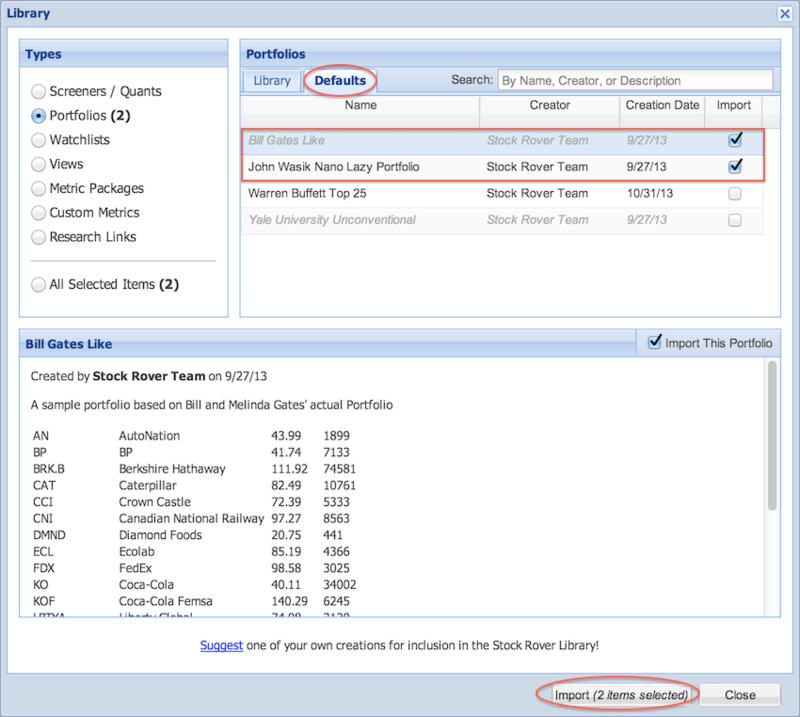 You can also click the down-arrow to see (or modify) the historical entries for that portfolio. 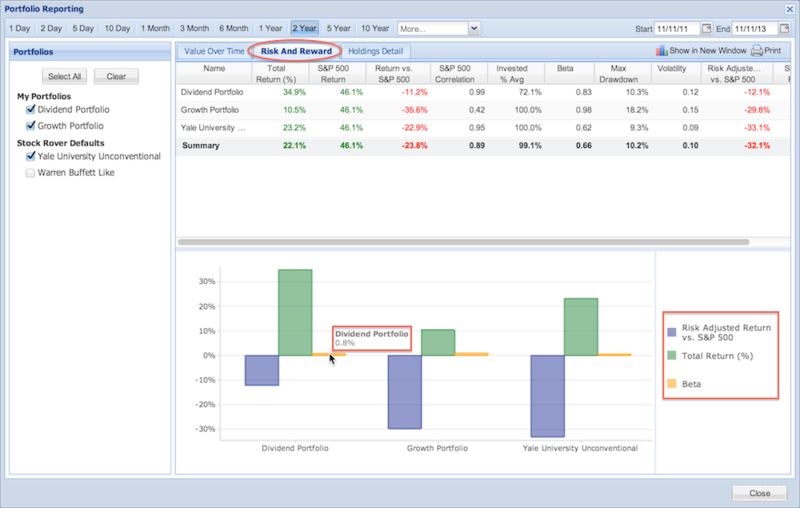 Now with your portfolio’s historical entries you can get the maximum amount of utility from the new Portfolio Reporting facility, which you can access from the top toolbar. 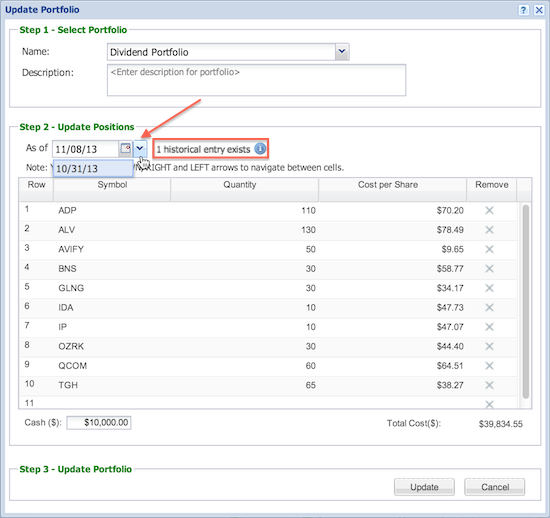 In the Portfolio Reporting window (shown below) you can select the portfolios on which you want to report and over what time period. 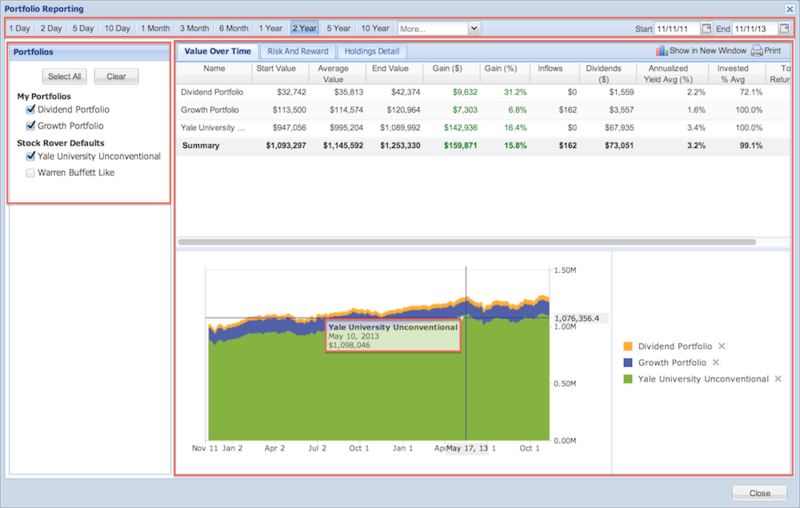 The according analytics are shown in the table and charts. There are three tabs in the Portfolio Reporting facility. 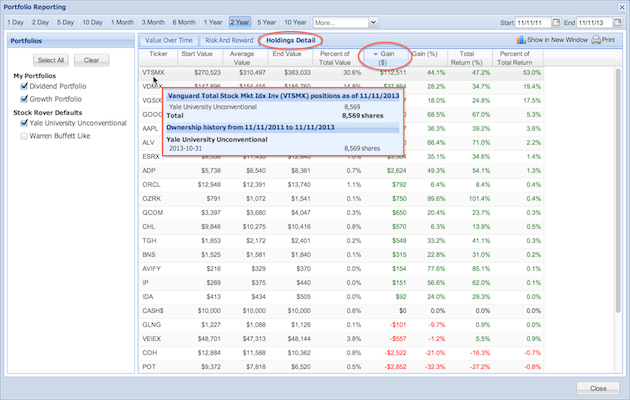 Value Over Time (shown above), shows you key metrics and a chart related to the change in value of your portfolios. The table shows the portfolios’ start- and end-values, gain, inflows, dividends, annualized yield average, invested average, and total return. Like in the main Table, clicking on a column header sorts the data, so you can easily see the best and worst performers of the group. Mousing over the chart shows more information in a tooltip. 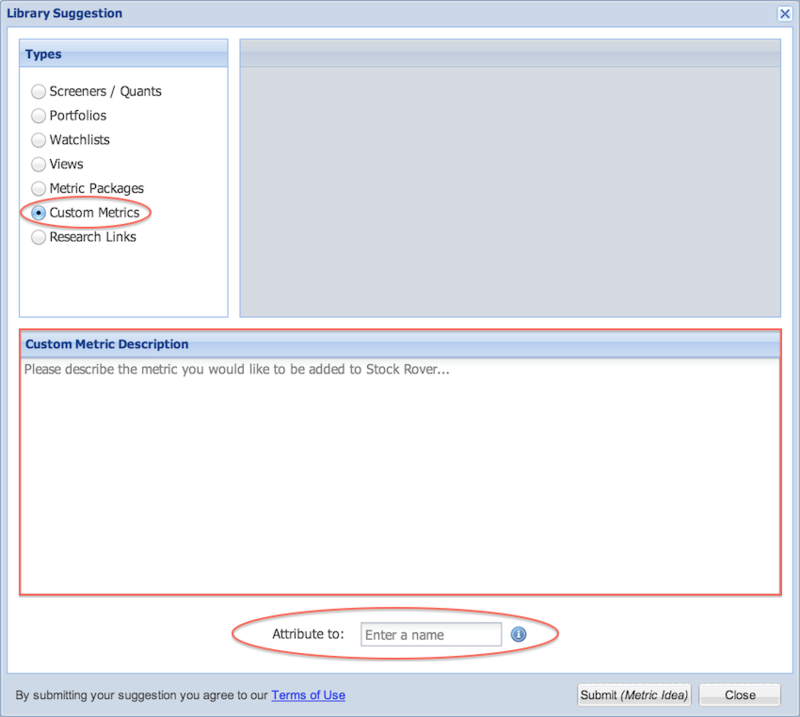 The middle tab, Risk and Reward, contains metrics to give you a good picture of how risky your portfolios are. This includes Max Drawdown, Risk-Adjusted Return vs. S&P 500, the Sharpe Ratio, and several others. The accompanying chart shows Risk Adjusted vs. S&P 500, Total Return, and Beta. 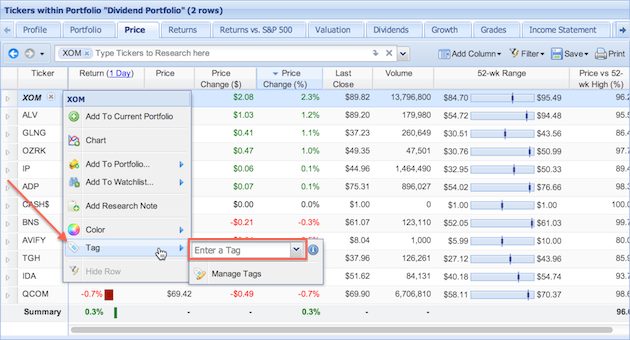 The last tab, Holdings Detail, shows all your holdings in metrics related to value, gain, and return. Mousing over a ticker symbol shows the number of shares you own and in which portfolio, as well as the date you acquired those shares. Clicking the ‘Show in New Window’ button in the top right will open the Portfolio Reporting facility in a new browser window so you can pop it out of the Stock Rover screen to see them both at the same time. Clicking ‘Print’ opens the data in a new browser tab in a format that can be printed or copy-and-pasted into another program. 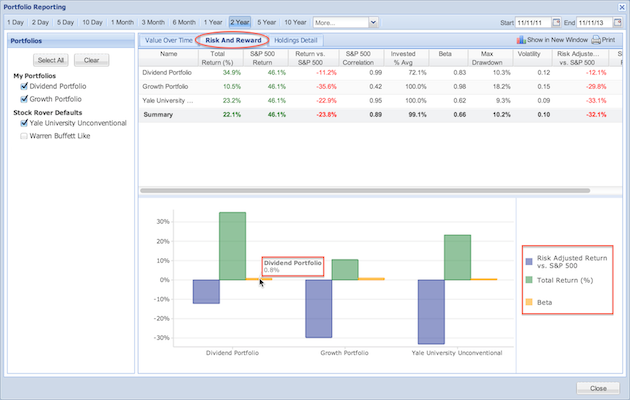 So there’s an outline of what you get in the Portfolio Reporting window, but of course it’s best for you to just try it out for yourself. It is an immensely powerful tool for analyzing your portfolios in ways not possible in the main part of the Stock Rover app. Perhaps you’ll discover new and fruitful ways of looking at your investments! Lastly (but certainly not leastly), the Investors’ Library. This is where you can not only import items like screeners, portfolios, watchlists, and Views from other Stock Rover users directly into your Stock Rover account, but also upload your own stuff to share with the Stock Rover community. In other words, it’s our first major step toward making Stock Rover social. Here’s how it works: open the Investors’ Library via the ‘Library’ button in the top toolbar. In the Library window, you can select a category to browse, see details for any selected item, and import anything that interests you. You can import multiple items at once, and browse across different types of items while your selections are saved. Click the ‘Import’ button at the bottom to instantly import those items into your account. Once in your account, they’re yours, and you can use them or change them however you would like. 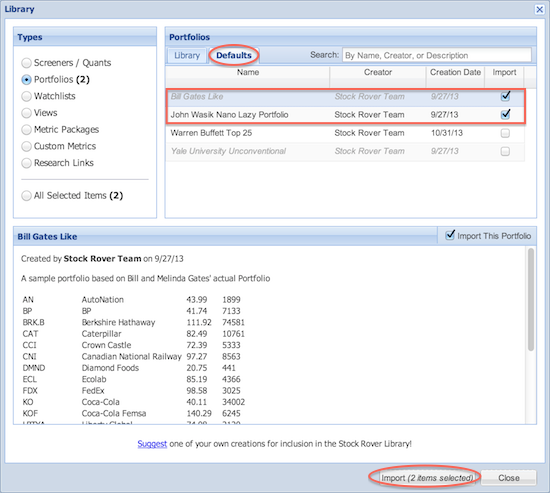 The Investors’ Library also makes it easier to restore defaults that come with your Stock Rover account, such as sample watchlists and portfolios, screeners, and View tabs. Find all our factory defaults in the Defaults tab of the Library. Note that if an item in the Library is italicized and greyed, it simply means that you already have an item of that type with that name. You can still import it and Stock Rover will automatically add a number suffix. You can rename it once it has been imported. You can add your own items to share with the Stock Rover community by clicking the ‘Suggest’ link at the bottom of the window. This will open a second window where you can select from your own Stock Rover items, add any notes, and add your name (you can also opt to remain anonymous). There is an approval process your submission must go through before it gets added to the Library. You can read more about thathere. 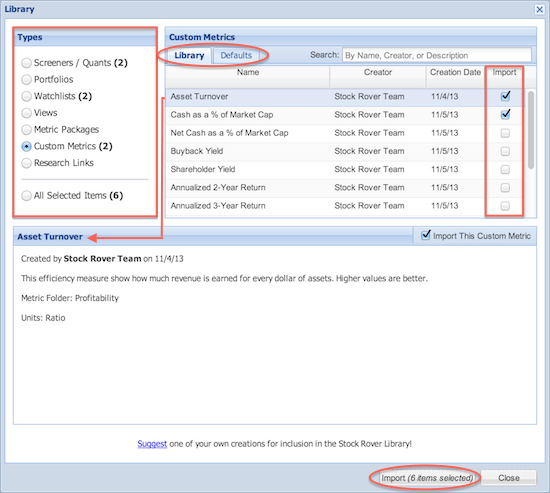 There is one special aspect of the Investors’ Library that I want to point out: the ability to request custom metrics. 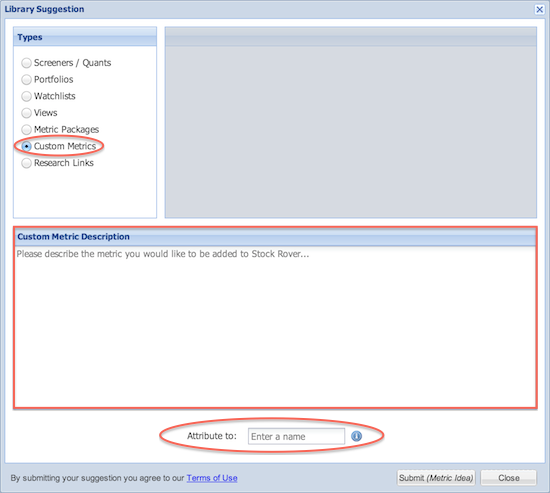 The ability to create custom metrics from existing Stock Rover metrics has been one of the most popular requests from our users. So we are thrilled to present this feature to you. To request a custom metric (that is, any metric that is not currently available in Stock Rover), follow the instructions for suggesting an item for the library (described above, and more extensively in our help documentation) and select ‘Custom Metrics’ from the Types menu. Here you will be given a whole bunch of white space where you can tell us all about the metric you want to see. It would help us if you can be as specific as possible, and even include an equation if you know it. The Stock Rover team will review the request for feasibility and, if possible, add the metric to the Investors’ Library, so you and any other user can import it. We hope this will be a quick and easy way for you to get the metrics you want in Stock Rover. You can add any of these to the Table by searching for them with the ‘Add Column’ button. 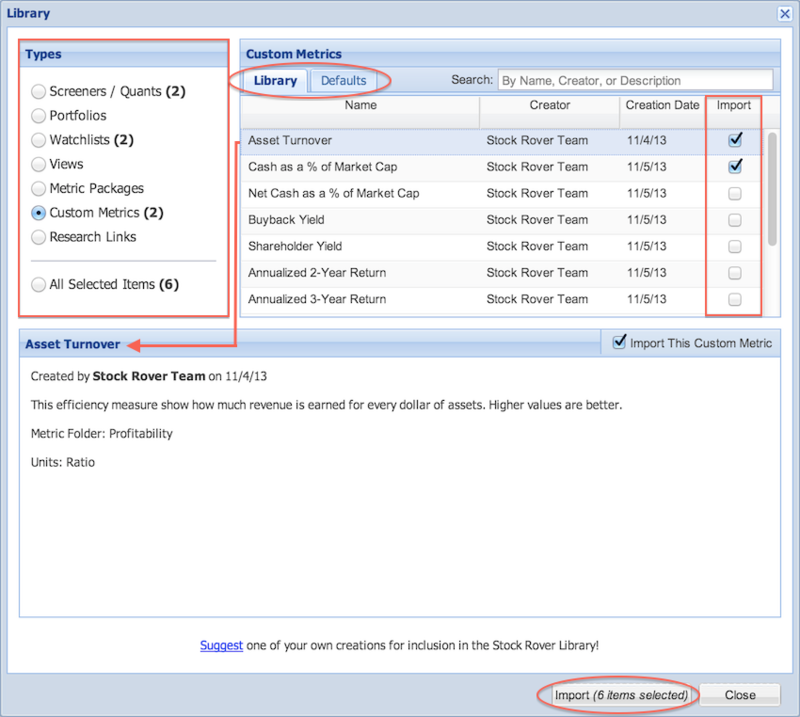 Note that the last one, Gross Profit/Total Assets, lets you create a Novy-Marx Quality screener. So, that about sums up the latest release! 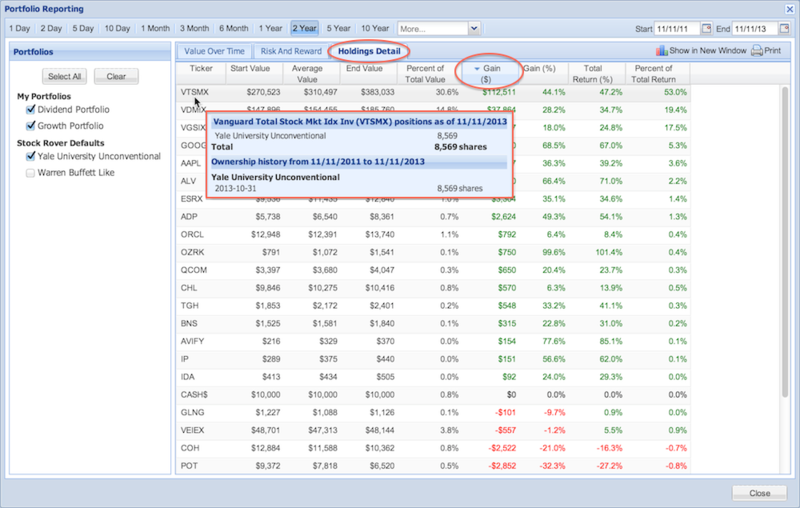 With these additions Stock Rover is more powerful than ever, and the Portfolio Reporting facility in particular gives you unprecedented access to analytics that show how your portfolios are truly performing. As always, we encourage you to explore the new features and let us know what you think. Email feedback@stockrover.com with any questions or comments.